Yes, that’s right, if all goes as I’ve planned and I don’t get trapped in ahem Plurk…again (still? 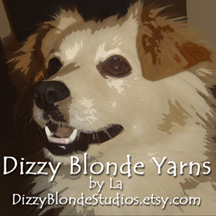 )…Dizzy Blonde Studios will be open for business some time on 08/08/08…that’s Friday. That’s THIS FRIDAY! With a smile as genuine as the faux topaz and amber adorning her neck; whiskey or bourbon (depending upon the depth of the pocket) loosens the lips and wallets at the gaming tables; pipe and cigar smoke haze the air as she deftly treads the boards. “Come up and see me…” Where’s home to this Frisco Doll? Why, The Corner Saloon. If all goes according to plan, you’ll be able to click on the picture on the yarn page here at Fibercrack’d, and it’ll take you to the corresponding sale page at my etsy shop. Your title today is exactly how I feel about my job. So pumped, DORIS is so mine!